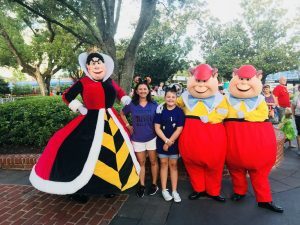 Disney World Crowd Calendar – 2019 Best times to visit! Use this Disney World Crowd Calendar because planning for your Disney Vacation is no small endeavor!? There is so much to consider when deciding on the perfect accommodations and time of year to visit.? Use the Disney World crowd calendar below to help gauge?crowd levels and best times of year to plan your Disney vacation. 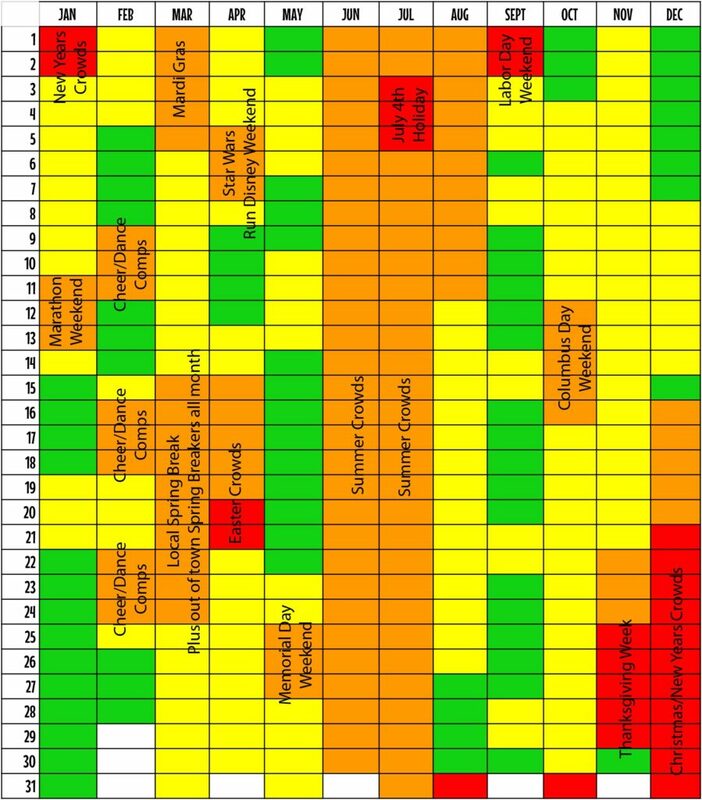 The Disney World crowd calendar below is a best guesstimate of crowds based on previous years crowds and varying events and holidays throughout the year.? Over the past few years, the parks have become more and more steadily full and the low crowd times of the year seem to be fewer and farther between.? It’s all somewhat relative,?as the slow times have been less slow and the more crowded seasons even more crowded. January Crowds taper off after the 2018 holiday season towards the end of the month.? With EPCOT’s newest festival, Festival of the Arts now taking place in January there is a steady crowd of travelers to see this. February?Lower crowds for most of the month with high peaks on weekends with cheer and dance completions taking place at Wide World of Sports. March? Mardi Gras happens in early March which always brings in a crowd to escape the New Orleans area.? Spring Break crowds will also pick up steadily throughout the month. April ?Star Wars 1/2 Marathon weekend and Easter weekend will see heavier crowds. May?As school comes to a close and Memorial Day Weekend ends the month the summer crowd season will set in. June summers at Disney are hot and crowded.? You can read 5 Ways to Beat the Heat on your Disney World Vacation here. July?? ?There is typical summer crowds throughout July with extra heavy crowds over the 4th of July. August? ?The end of summer crowds wrap up mid to the end of the month and the parks start to thin out. September? ?Labor Day Weekend has the last of the heavy summer crowds.? Then the end of September?is one of the least crowded times of the year. October? 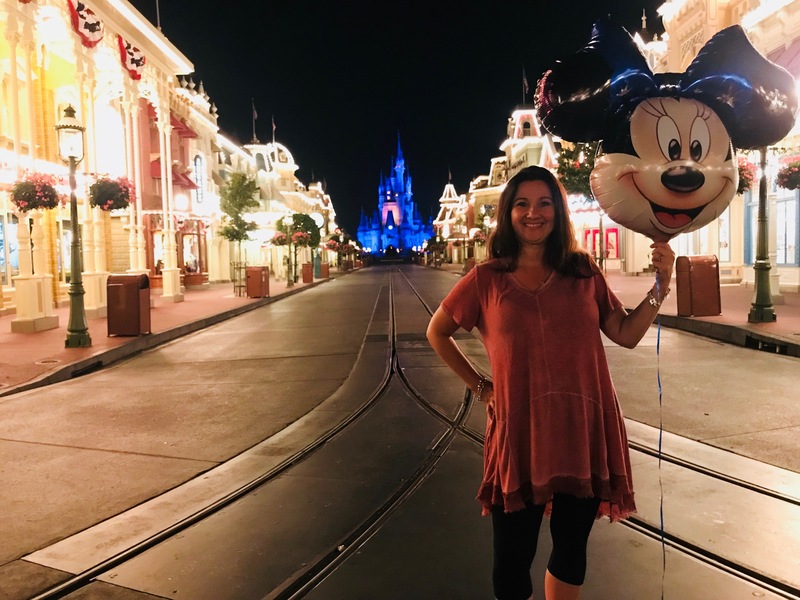 Guests enjoy Mickey’s Not So Scary Halloween Party for most of the month (it happens September – October) There is also an increase in crowds this month for travelers with fall break. November?Early in November has light crowds until Thanksgiving week when the really heavy crowds show up.? The holidays, Thanksgiving and Christmas Day are the two busiest days of the year.? The week after Thanksgiving is often very low crowds. December?Crowds are at their heaviest on Christmas Day and the days leading up to it and New Years.? If you plan to visit this time of year make sure to pack your patience!